Luxury yacht charters Greece. Crewed yacht charters in greek islands. The Ionian Islands, also known as “the Seven Islands” are a group of seven main islands and several smaller lying in the Ionian Sea, on the western side of Greece. It is an ideal place for yacht charter vacation and relaxation, the scenery is completely different from the Cyclades, covered by pine forests and olive groves, with excellent climate, rugged coastline and awarded exotic white sand beaches and turquoise waters. All this combined with an excellent tourist facilities, hotels, restaurants, cosmopolitan ports, marinas for yachts and sailboats, waterfalls, paths, great asphalt trails, wetlands, mountains and marine parks, where they find shelter turtles and seals, cultural events and many attractions as well as historical monuments and museums. The Ionian Islands are also ideal destination for those who love water sports and especially windsurf and kite surf. This complex of islands will surprise you with the richness of gastronomic experiences and refined tastes can offer, the local cuisine is based on meat and local wines with strong flavor and almost semi-sweet. Kerkyra, usually known as Corfu is the most cosmopolitan island which maintains its Venetian charm, enriched by the influence of the brief French occupation and 50 years of British rule. The island of Corfu has been described as the Emerald island and Garden of Eden by Homer this is due to the green hills, large mountains, clear blue sea, clean white sand, large land with olive trees and colorful wild flowers. Corfu consists of traditional fishing villages and large modern resorts, combined with the amazing wildlife. On the island there are over six hundred types of wild flowers and numerous exotic birds. Paxoi is a cluster of small islands and islets, the largest of which are Paxos and Antipaxos. The eastern coast of Paxos island is smooth, while the western steep, with remarkable formations: caves, arches, domes, sheer cliffs. There are beautiful and peaceful beaches with crystal clear waters, perfect for enjoyable swimming. The island has become a favorite destination, but continues to keep its natural beauty. This peaceful and natural landscape is that makes a holiday in Paxos truly memorable. Lefkada also known as Lefkas is the island of poet a color paradise of sounds and colors, combines the landscape of idyllic and rough pictures and set as a popular tourist destination. In Lefkada also lies the Skorpios, the small island purchased by Aristotle Onassis. The beaches of Lefkada is famous for its blue waters, Porto Katsiki have been awarded many times as one of the best beaches worldwide. Ithaki known as Ithaca the home of Ulysses, symbolizes the journey and destiny of life. An island of great natural beauty, tradition, picturesque towns, unique history and culture. Ithaca is a wonderful island to explore, quiet and perfect for a relaxing holiday. Kefalonia, beautiful golden beaches, high mountains, bizarre cliffs, the cave of St. Gerasimos – the patron saint of the island, Drogarati cave, the underground Lake Melissani, churches and monasteries built on the cliffs, the traditional villages, caves and caves, some of which have become major tourist attractions. Mountains with trees, vast land with olive trees and vineyards wine of Kefalonia is one of the best in Greece. From the traditional Fiskardo to the small tourist town of Poros and the fascinating villages that captivated Lord Byron with their beauty, Cephalonia reveals to the visitor a taste of paradise at every turn. The rock Ainos stands over the Ionian Sea and offers a panoramic view over Cephalonia and the surrounding islands. The “Big Mountain”, called Monte Nero by the Venetians, with its unique forest, offers visitors tranquility. Zakynthos sometimes known as Zante, the southernmost island of the Ionian Islands, was “The Flower of Levant” an ideal holiday destination. 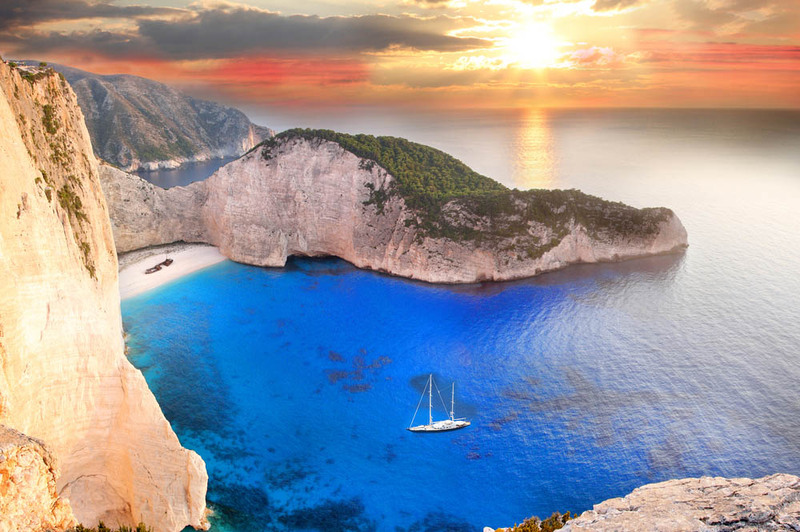 The Zante, as also said that has the best beaches of the Ionian and the capital the town of Zakynthos is the largest natural harbor of western Greece, under a spectacular rock Bochalis, on which Dionysios Solomos wrote hymn to Freedom, the Greek national anthem. The island has much to offer any visitor, from splendid sandy beaches, the chance to see the Caretta Caretta turtles and seals monks, impressive monasteries and churches with frescoes and icons, as well as the famous Blue Caves and the famous beach of Zakynthos, Shipwreck, one of the most photographed places in the world. Discover Ionian Islands via our selection of luxury yachts.